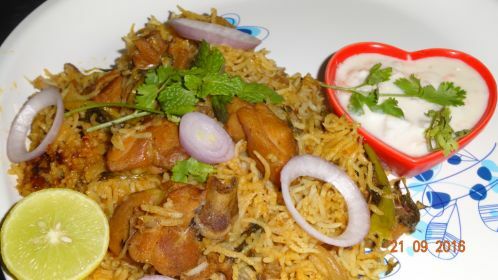 Hi…Hello…Today i am introducing the preparation of spicy chicken dum biryani in my own style and easy method… So you also try this method, taste it and give me your valuable comments…..
Take a nonstick kadai…heat some oil…. in that add chicken, ginger garlic paste, some salt, red chilli powder. mix it and close with lid. After 10 min add a glass of water in that. Cook well till the water will completely disapper. Now off the flame and keep aside. For any type of biryani, we have to soak the rice before one hour. So soak the rice before start the procedure. For this biryani, i am using pressure cooker.. so heat fresh ghee in cooker. At first in ghee, add masala powder. Now fry onion, chilles. ( chope these as shown as in picture). And fry ginger garlic paste, coriander leaves, mint leaves respectively. Add sufficient salt also. Now add fried chicken and soaked rice. Now mix carefully. Otherwise the rice will broken. Keep it in low flame for 5 min. Now add water .. Here we must follow the measurement for water. We must take one and half cup of water for one cup of rice. So you must follow this measurement. Because the Biryani taste was depends on water measurement. After adding water , close the cooker with vissel. Put in high flame for 3 vissels. After 3 vissels put in low flame for another 5 min. then off the flame. Then it was ready to eat. It was really delicious… and raita was the perfect partner..
Biggest Bollywood Star Begged at US Streets ! No Cash in ATM- An Unnoticed Scam of Hitleristic Banking Sector!